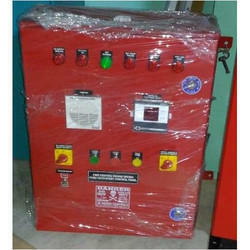 Prominent & Leading Manufacturer from Chennai, we offer fire fighting control panel, end suction fire pump spares and service, nm fire fighting diesel engine, cummins fire fighting diesel engine spares and service, cummins fire engines - cfp5e spares and service and fire pump control panel. Large hotels, hospitals , schools¿¿¿office buildings¿¿¿supermarkets, commercial residential buildings, metro stations, railway stations, airports, kinds of transportation tunnels, petrochemical plants, thermal power plants, terminals, oil depots, large warehouses and industrial and mining enterprises, etc. The CFP5E features a cast-iron parent bore block structurally-designed to reduce noise and increase durability. 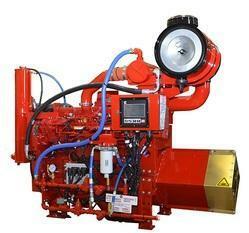 One of the Cummins fire pump drive engines that offers flexibility to owners with its electronic-controlled Variable Speed Pressure Limiting Control (VSPLC) option. High Pressure Common Rail (HPCR) Fuel System with Full-Authority Electronic Controls - Delivers high injection pressure (1600 bar) for improved performance and fuel efficiency at every rpm. 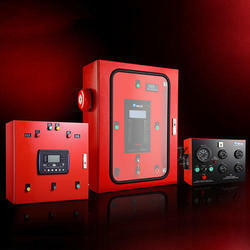 Electronic controls deliver critical information for controlling costs, reducing maintenance, and seamless integration with other components. In-Cylinder Combustion Technology - Meets emissions standards without external components. Parent Bore Cylinder Block - Designed for reduced noise and increased durability. Built to handle high pressures. Directed Piston Cooling - Extends lifespan with lower piston temperatures. Wastegated Turbocharger - Designed by Cummins Turbo Technology, Holset® wastegated design optimizes operation across the torque curve with better low-speed performance and high-speed boost. Centered Injectors with Symmetrical Piston Bowls - Improved airflow and even fuel dispersion provide increased power, improved transient response, and reduced fuel consumption on 16-valve versions of the QSB engine. Two-Stage Fuel Filter - Provides a balanced level of particle separation to maximize fuel filter life and protect vital fuel system components. Rear Gear Train - Significantly lowers noise output to meet worldwide noise emission standards. Wider Camshaft Lobes and Larger Tappet Wear Surface - Enhance durability and reliability. The CFP59 engine is built to last. With over 12,000 installations worldwide, the painstaking attention to details in the design makes this engine reliable and durable. It'll be on the job, ready to start every morning for years to come. Plateau-honed Cylinder Liners – reduce frictional losses, oil consumption, and emissions of internal combustion. Forged Steel Camshafts and Crankshafts - Enhance durability and reliability. The CFP7E features a cast-iron parent bore block structurally designed to reduce noise and increase durability. 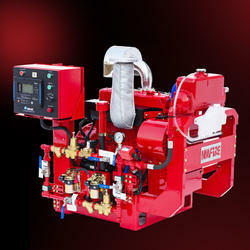 One of the Cummins fire pump drive engines that offers flexibility to owners with its electronic-controlled Variable Speed Pressure Limiting Control (VSPLC) option. Centered Injectors with Symmetrical Piston Bowls - Improved airflow and even fuel dispersion provide increased power, improved transient response, and reduced fuel consumption on 24-valve versions of the QSB engine. The CFP9E F65-F85 high horsepower model has advanced electronics, higher torque, and higher horsepower than the standard CFP9E while still offering shorter service times, longer maintenance intervals, increased fuel economy, and up to 50% less noise. High Pressure Common Rail (HPCR) Fuel System with Full-authority Electronic Controls - Improves cold-weather starting and allows multiple injection events for cleaner, quieter operation with consistent performance at every rpm. 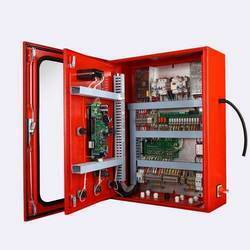 Electronic controls deliver critical information for controlling costs, reducing maintenance, and seamless integration with other components. Stiffer Block and Head - Reduces noise and vibration. Fluid circuits are integrated, replacing hoses and eliminating potential leaks. Patented Mid-stop Cylinder Liners - Resist cavitation, extend life-to-overhaul. Improved Piston Design – Delivers optimal combustion by combining symmetrical piston bowl with centered injectors. Ni-Resist piston inserts give exceptional oil control for longer life. Improved Crankcase Ventilation - Virtually eliminates oil carryover. Valve Cover and Gasket - Isolated design with perimeter bolting allows for better sealing and improved reliability. Heavy-duty Lube System - Targeted piston cooling and increased lube flow to the power cylinder result in increased piston reliability and durability. Improved lube and bypass filtration system increase ring and bearing life by as much as 63%. Heavy-duty Roller Followers - Camshaft roller followers give the QSL engine superior durability and camshaft life. Auto-tensioning Belt Drive - Self-adjusting for optimum tension, increases fan, alternator, and fan belt life. Gear Housing Design and Front-end Support – Improves durability with gear housing and accessories mounted directly to the block. The CFP83 block is designed with gaskets that reduce oil consumption. 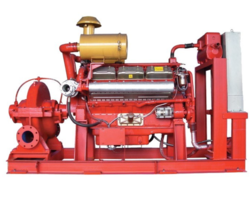 This model was introduced by the Cummins engine plant to the fire pump industry in the early 1990s and has proven to be the reliable mechanical engine that is representative of the Cummins brand. Heavy-duty Pistons – complete with Ni-Resist inserts, extend life-to-overhaul. Plateau-honed Cylinder Liners – Virtually eliminate oil consumption, as well as reduce frictional losses and emissions of internal combustion. CFP59 The CFP59 engine is built to last. With over 12,000 installations worldwide, the painstaking attention to detail in the design makes this engine reliable and durable. It'll be on the job, ready to start every day for years to come. 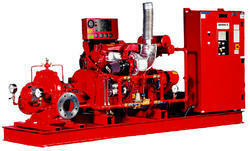 CFP7E The CFP7E features a cast-iron parent bore block structurally-designed to reduce noise and increase durability. One of the Cummins fire pump drive engines that offers flexibility to owners with its electronic-controlled Variable Speed Pressure Limiting Control (VSPLC) option. 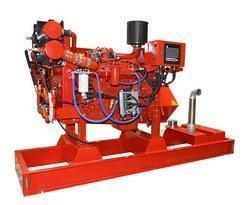 CFP83 The CFP83 block is designed with gaskets that reduce oil consumption. 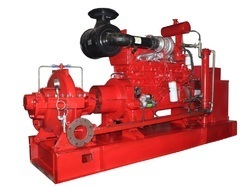 This model was introduced by the Cummins engine plant to the fire pump industry in the early 1990s and has proven to be the reliable mechanical engine that is representative of the Cummins brand. With advanced electronics, higher torque, and better speed control, the CFP9E allows for shorter service times, longer maintenance intervals, increased fuel economy, and up to 50% less noise. This midrange engine with the Variable Speed Pressure Limiting Control (VSPLC) option provides an additional array of horsepower options than the CFP5E or CFP7E models. The CFP9E high horsepower model has advanced electronics, higher torque, and higher horsepower than the standard CFP9E while still offering shorter service times, longer maintenance intervals, increased fuel economy, and up to 50% less noise. CFP11E This CFP11E model was one of the first electronic-controlled engines and has been one of the mainstays to the product line since its Cummins Fire Power inception. Every Cummins 11L engine is designed to go the distance, with heavy-duty components that have been proven in hundreds of applications around the world. CFP15E With advanced electronics, higher torque, and better speed control, the CFP15E allows for shorter service times, longer maintenance intervals, and increased fuel economy. 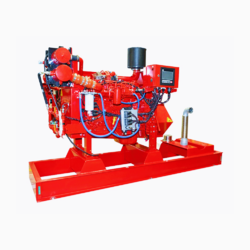 The speed-range tested CFP15E Industrial model with the Variable Speed Pressure Limiting Control (VSPLC) option is the right choice for the heavy duty engine market. CFP23E The CFP23E engine platform is available in the G-Drive ratings which provide higher torque values, and as an Industrial model for any Variable Speed Pressure Limiting Control (VSPLC) application requirements. It has advanced electronics which are capable of smooth operation, higher torque, and better speed control. 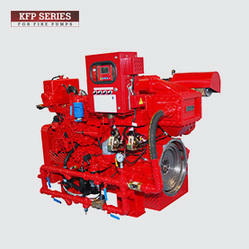 CFP30E The CFP30E has higher torque, shorter service times, longer maintenance intervals, and increased fuel economy. Customers request this model due to the durability and compactness of the design which can be configured to meet most applications. Also one of the Cummins fire pump drive engines that offers flexibility to owners with its electronic-controlled Variable Speed Pressure Limiting Control (VSPLC) option. 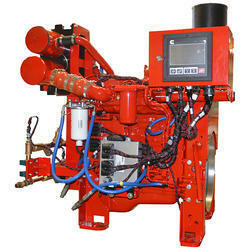 CFP50 The rugged CFP50 has the proven mechanical pressure-time (PT) fuel system with a Woodward hydraulic governor. It has demonstrated its reliability in several applications with many configurations custom-designed for the oil and gas industry. 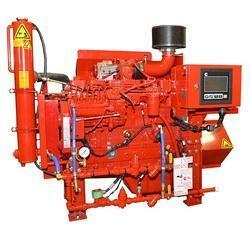 CFP60E The CFP60E has higher torque, shorter service times, longer maintenance intervals, and increased fuel economy. Customers request this model due to the durability and compactness of the design which can be configured to meet most applications.